We believe the basis of any thetherapeutic care activity is to understand the person’s past and present relationships to others and to empower them to talk about their memories and give them a chance to contribute and feel involved. So we pride ourselves on providing Relationship Centred Care which takes the well established concept of Person Centred Care one step further and puts each resident at the heart of a mutually beneficial relationship between their family and friends, our staff and the healthcare professionals who work in and visit the home. For residents in a social care environment, relationship centred care can be illustrated by a “relationship triangle”. 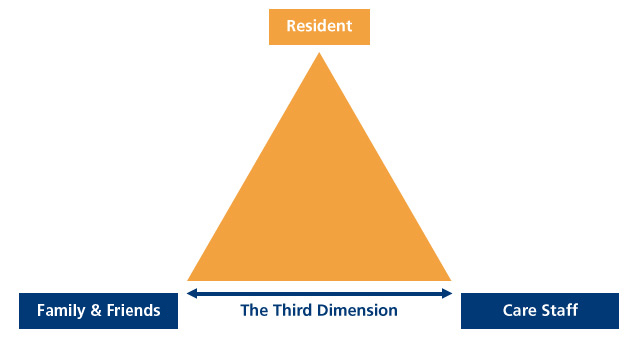 This illustrates “the third dimension” in which care staff and family/friends develop relationships directly with each other, in addition to their traditional relationships with residents. These are an excellent way to get to know the residents better.They empower residents to talk about their memories and give them a chance to contribute and feel involved.They are also beneficial to staff by helping them to understand the residents’ care needs from a much wider perspective.Where possible, the histories are compiled by friends and families and they ideally include testimonials by significant people in residents’ earlier lives. When residents move into care, it is often difficult for relationships with their wider family and friends to be maintained.In order to help them to keep in touch, our aim is to maintain contact details for all residents’ children and grand-children.These can then be used for party invitations, newsletters and updates on residents’ social programmes. We are placing particular emphasis on building relationships with residents’ grand-children (usually in their 20′s/30′s), as residents really value contact with them and this age group is often reluctant to visit care facilities. Residents’ care plans and daily reports are fully computerised and we have developed a facility for relatives and friends to view all the residents’ records at any time (and from anywhere!) using RESILINK, a secure on-line link. This is strictly subject to the resident’s consent or to a “best interest decision” on their behalf. Relatives are finding that having on-line access really helps them to maintain on-going contact and to maintain much stronger relationships with both the residents and staff. Having built a wide contact base of residents’ relatives and friends, the use of email provides efficient distribution of regular news updates and allows it to be read much more widely (particularly by grand children and outside professionals).